The Plant City Family YMCA hopes children can push families to get in the gym. Finding motivation to go to the gym regularly can be difficult — especially for people with young families. With that in mind, the Plant City Family YMCA is reaching out to the people who can get those families in the gym: the kids. Just shy of 1,500 members, the Plant City Y is hoping to bring in more families this month and showcase all of the changes made under Hilferding and the newly-retooled staff. Though the physical structures in the kids’ areas haven’t changed since he joined the staff, many of the programs have. The Y’s kids programs cater to those as young as six weeks and offer enough physical challenges to keep them busy until they become old enough to work out on the gym floor. It starts in the Kids Zone, which works with children until they go to kindergarten. That zone recently got some help from an outside source. CityPointe Church donated $2,500 to be put toward play areas, teaching tables, educational books and more, and the Y has already implemented most of the new materials. The Kids Zone staff teaches children basic reading, writing and arithmetic concepts and keeps them moving, through camp-style games and activities, to keep them healthy. After kindergarten, the kids can use the Zeno Zone next door. 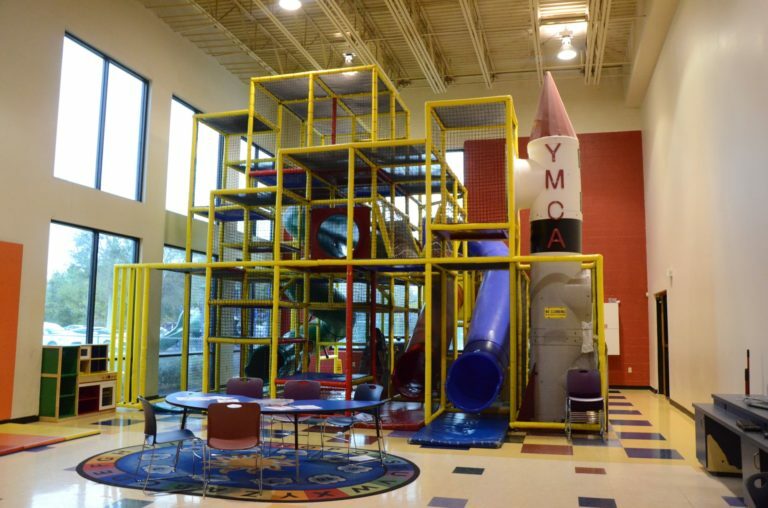 This room, which features a three-story play structure, is where most of the play time happens. The Plant City Family YMCA has a “water park” area for kids to play while their parents swim laps. The room also features a rock climbing wall, a computer with educational programs and an Xbox game console with a Kinect attachment — a device that detects bodily movement and comes with sports and dancing games that require children to get up and move to play. Those kids also have the option of using the water park, which has two three-story slides and a mushroom fountain, after passing an annual swimming test. The outdoor area also includes the playground. The Y’s staff made things as fun as possible for the kids in order to keep them interested, which brings parents into the building. Families that want to exercise together do have options, from playing sports to taking group classes designed for parents and children. Most recently, a family Barre3 class was added to the Y, which uses ballet concepts in workout routines. Hilferding also says that an outdoor family boot camp is in the works, though a start date has not been set as of press time. Ultimately, the goal of Hilferding and the Y is to set a standard for healthy living early enough to affect children in the long run.